Step 1 Position an oven rack in the upper-middle position and heat oven to 375 degrees F.
Step 2 Trace the bottom of an 8-inch square pan or 9-inch round cake pan on kitchen parchment, then cut inside the lines to create a piece to fit in the bottom of the pan. Step 3 Coat the bottom and sides of the pan with 2 tbsp extra virgin olive oil, turning the parchment to coat on both sides (the oil should pool at the bottom and generously coat the sides). Step 4 In a food processor, combine the parsley, cilantro, dill, scallions and the remaining 3 tbsp extra virgin olive oil. Process until finely ground (now, I like my herbs less fine, so I stopped the processor at my desired texture). Set aside for now. Step 5 In a large bowl, whisk the baking powder, salt, cardamom, cinnamon, cumin and pepper. Add 2 eggs and whisk until blended, then add the remaining eggs and whisk until just combined. Fold in the herb-scallion mixture and the walnuts and cranberries, if using. Pour into the prepared pan and smooth the top. Step 7 Let the kuku cool in the pan undisturbed for 10 minutes. When ready, run a thin knife around the edges to loosen the kuku. Invert onto a plate and remove the parchment from bottom, then re-invert on another serving plate or a cutting board so the top of the kuku is facing you. Slice into wedges and serve warm or at room temperature. 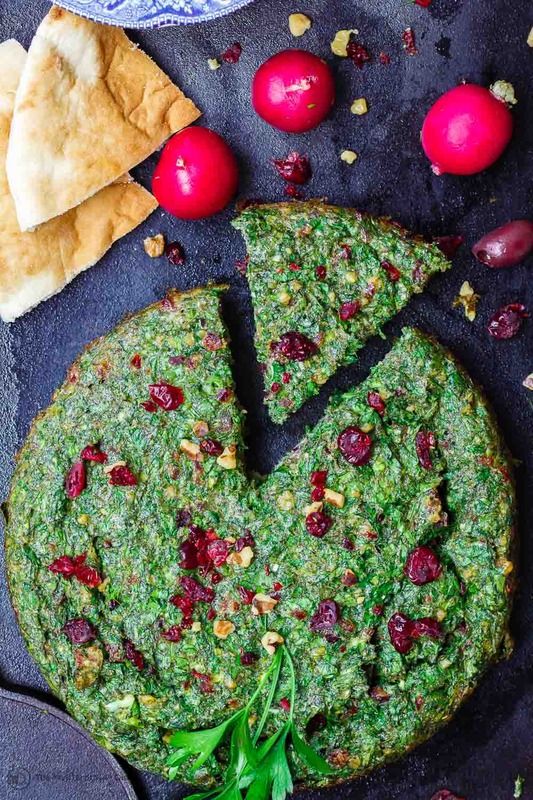 I think of Kuku Sabzi as the Persian’s festive, herby, and flavor-packed take on frittata or omelet (in this case, baked omelet). I’m excited to share this version from the cookbook Milk Street: The New Home Cooking. More about the book and a great giveaway below! Not just for breakfast – I made this for dinner as well, my friends were amazed how delicious it was!